I have a special place in my heart for Roosevelt Island, that narrow land in the East River once known by such welcoming names as Welfare Island and Blackwell’s Island. Until the urban development experiments here during the 1970s, I never thought it particularly a family friendly place, unless your family happened to be criminal, mentally insane or both. A new exhibit by the Roosevelt Island Historical Society proves me wrong. 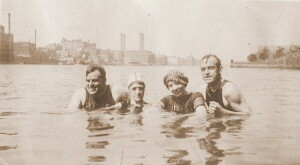 This month the society displays, Family & Friends: The Effler Family on Blackwell’s Island, a collection of photographs from 1914-1919, detailing everyday life on the once-isolated home of New York’s ‘undesirable’ industries. The Efflers led a surprisingly typical life amongst the inmates and infirm; one can only imagine what their children saw everyday as they played along the island’s streets and back alleys. And the best part is that the photography exhibit takes place at the Octagon, a residential building that used to be the island’s lunatic asylum. The exhibit is free and on display through the 31st of January,with a special reception at noon, January 18. The Octagon is located at 888 Main Street.